The older I get, the less variation there is on my holiday wish lists. And I guess I'm okay with that. A few years ago I received a few pair of PJ pants. I've worn them until the elastic is totally dead in one pair, and the other two probably aren't far behind. 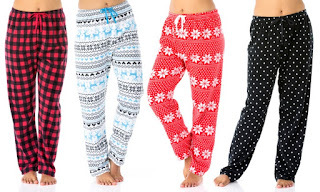 I would love some more cozy PJ pants. They have to be pants (not shorts) and don't bother with full PJ sets - the shirts are never as comfy as just stealing one of hubs t-shirts. I think the link here goes to Target, and I think the last ones I got were from Old Navy. I'm not that picky - as long as they're long and cozy, I'm good. My very favorite shirt to wear with my PJ pants is actually a crewneck sweatshirt that I've had for probably years. It's heading for threadbare in a hurry, but for now it covers what I want it to, and is just a little thicker than a cotton t-shirt, so it feels a little less see-thru. I don't think what I feel for that sweatshirt will be duplicated anytime soon. But new pants will be fantastic. If I got pants like these, I’d probably end up wearing them around the house all the time. They look very comfy! Cozy jammies are my absolute favorite thing in the winter! I have SO many pairs!!! LOL!!!! Honestly - I think I have at least 6 pairs that I switch off - HA!! !